Apparently, I have little else to talk about lately expect the dog. Not true, really. 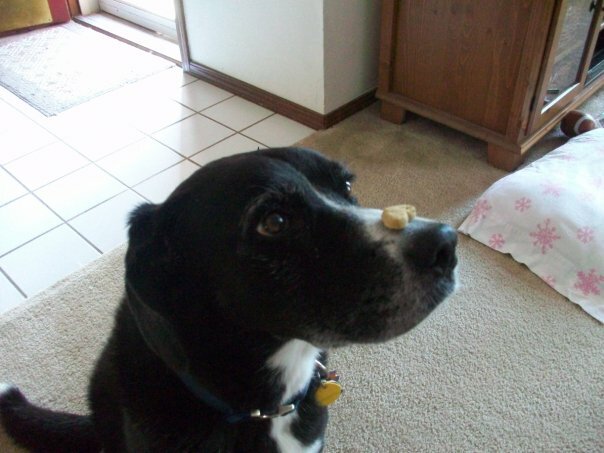 But, I did want to post this pic of Lucky balancing a treat on her nose, waiting patiently for the “OK!” to pop it up and catch it. Yep, she’s awesome and full of surprises. As an update from the previous post about her, the animal ophthalmologist said she had an ulcer on her cornea…and that these are very painful and slow healing. nice. way to make a dog owner feel TERRIBLE. Especially one that waited 3 or 4 weeks to see the dr…hoping the eye would just get better by itself. nice. So, now we’re (and by we i mean I) approaching 3 weeks of putting drops and gels in that dogs eye. 3 different meds, 3 times a day. That’s 9 times/day. That will be 189 times we’ve (again “I”) put something in her eye in 3 weeks. 189! and the silly goose still comes to me when I call her. She’s either very loyal and obedient, or very stupid. Good news is the eye looks completely healed. We’ll still be going for a follow up visit and doing EXACTLY what the dr says for however long he says to do it, though. And, of course, throw in a nasty, double ear infection, too, for good measure. That greasy ear medicine is worse than all that eye goop combined. Now, I’m contemplating whether or not these detailed posts about my dog obligates me to talk in detail about my children. Maybe a post dedicated to each of them…nah. prob not. They are much more private than Lucky is. and sensitive.